The Tauern Windown has been studied by geologists since the mid 19th century, and research is still ongoing. The first geological maps of the region is the "Geognostische Karte von Tirol" of 1849, that differs three lithological units in this area, the "mica schists group (Gruppe des Glimmerschiefers)", comprising various schist's with mica, hornblende, chlorite and carbonate components, the group of the "clay mica schists (Gruppe des Thonglimmerschiefers), massive to schistous limestone, diorite and serpentinite" and single Serpentinite bodies. Fig.1. Geognostische Karte von Tirol, 1849, figure from here. The Tauern Window is the rosé area in the right upper part. Fig.2. Oblique 3D view of the transition between Centralgneiss and cover units (Bündner Schiefer) to the surrounding basement crystalline (Altkristallin / Austro-alpine nappes), modified after: Carta Geologica d´Italia (1967): Foglio Nr. 1 + 4a "Passo del Brennero e Bressanone" 1:100.000. 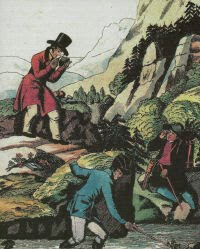 In 1851 the Swiss geologist STUDER in his book "Geology of the Swiss" compares the calcareous phyllites in the area of the Brenner Pass with the phyllites of the Swiss cantons of Bündens and Wallis, and notes that the Centralgneiss descends under these series. 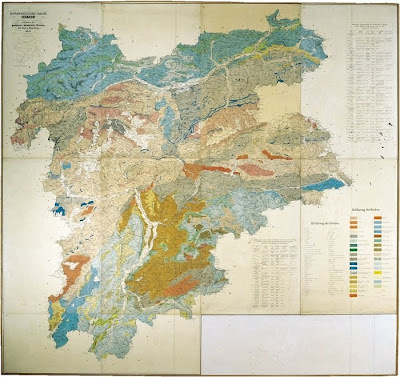 In 1853 the geologist of the Geological Survey of Austria, LIPOLD, STUR and PETERS describe the various lithological units and confirm that the schists are overlying the gneiss, and the unit shows a general dip away from the centre of the Tauern Window. They propose a general subdivision in Centralgneiss (Zentralgneiss), the Schists cover (Schieferhülle, comprising the old roof -Altes Dach- the Palaeozoic sedimentary cover and the permomesozoic Bündner Schists with intercalated ophiolites) and the old or basement crystalline (Altkristallin). STUR considers the Gneiss as a Triassic intrusion, mangled between and in the overlying units during the Eocene "a mechanic force of incredible impact... which was able to disrupt the precedent less affected order..., to overthrow the youngest on the oldest." Fig.3. Fine grained mica-granite on the left intruding in a Biotite-Plagioclase gneiss. 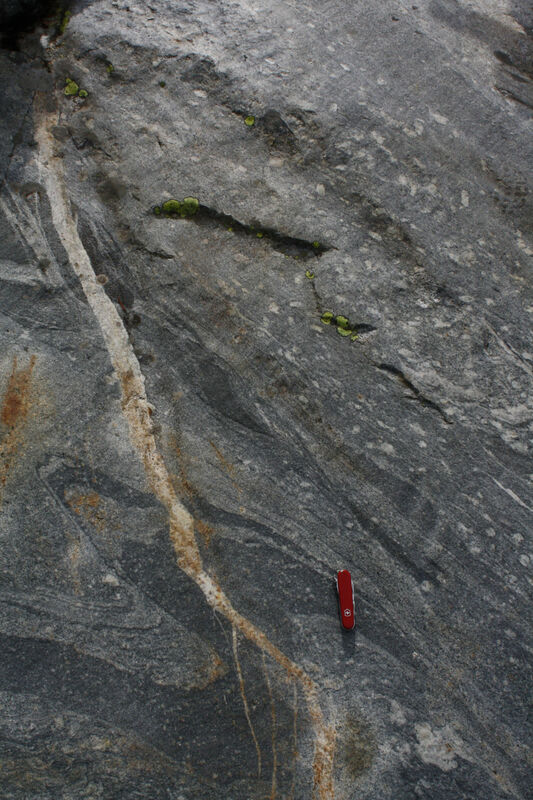 The gneiss has been partially melted and melt residuals concentrated in the white patches. 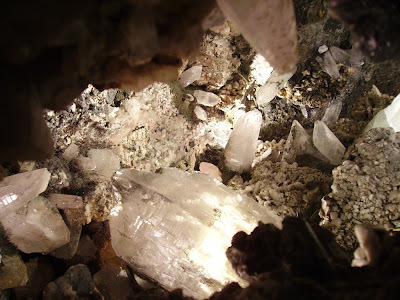 In the melt large Plagioclase crystals growth (rectangular white shapes). In a last phase open fissures caused by exhumation of the Centralgneiss and resulting brittle deformation were filled with a pegmatite. Between 1871 to 1872 NIEDZWIEDYKI studies and publishes the results of his survey of "Theilen der Zillerthaler Alpen und der Tauern", where he confirms the stratigraphic succession, and interpret it as continues sedimentation with no tectonic implications (It's interesting to observe how interpretations of same regions can differ such considerably). In 1872 STACHE subdivides the schist cover in two groups, and considers the gneiss as the base formation of the Alps. In the following years the lithological and stratigraphic relationships get elaborated in more detail, the schist cover is subdivided in a carbonate poor and carbonate rich part, and the "Matreier Zone" is introduced, a melange between the basement crystalline and the Schist cover. Fig.4. 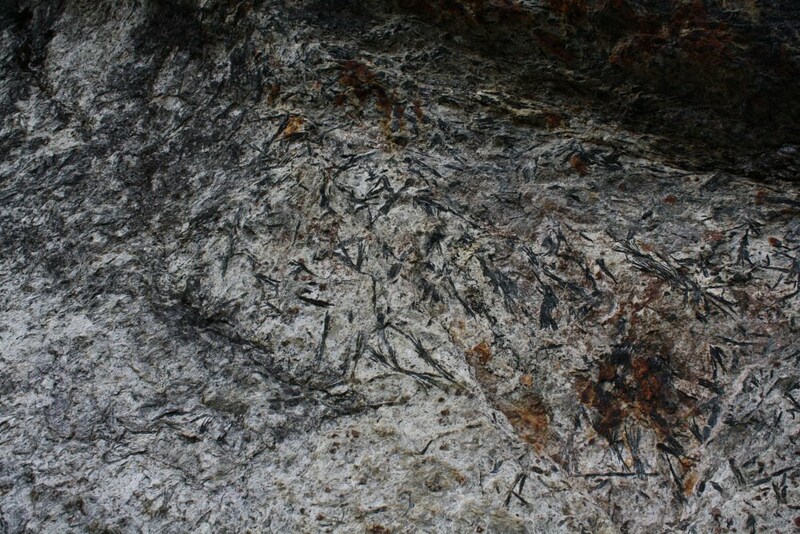 Schist with hornlende, so called Hornblendengarbenschiefer of the Greiner Serie, part of the "Old Roof". Until the beginning of the 20th century the observed metamorphic sediment units were considered autochthone, and so there was no significant progresses (or need) regarding tectonics to explain the succession of such different units. Then, in 1903 TERMIER applies the theory of tectonic nappes, first developed in the Swiss Alps, to the Eastern Alps, and explains the Tauern geology as a result of a tectonic window, formed by erosion of the upper nappes, and displaying the lower nappes of the Alps. In the classic Austrian geology since then the nappes of the Eastern Alps were subdivided in the lowest Penninic nappe (with the Tauern window as most prominent example) and overlying East Alpine nappes, with a lower, median and upper nappe comprising various units (in case of the Tauern window the surrounding crystalline basement). This classification was simplified in the last years. Not only is a strict subdivision not always possible, also it is more likely that the single nappes of the East Alpine don't represent a succession of deposition environments in different geological periods (as assumed in the past) but simple different facies in a spatial continuum of the former paleozoic Ocean, subsequentely stacked together bz the Alpine orogenesis. Today a more general term - "Austroalpine Deckeneinheiten", Austro-alpine Nappe Units, is preferred. Fig.5. Rich in Minerals are the hidden fissures...During the Alpine orogenesis and metamorphosis of the great varieties of rocks that compose the cover of the Tauern Window, circulating fluids deposited a rich variety of minerals in the fissures that opened during exhumation - Quartz, Plagioclase, Rutile , Amphibole and Gold depending from the surrounding source rocks. 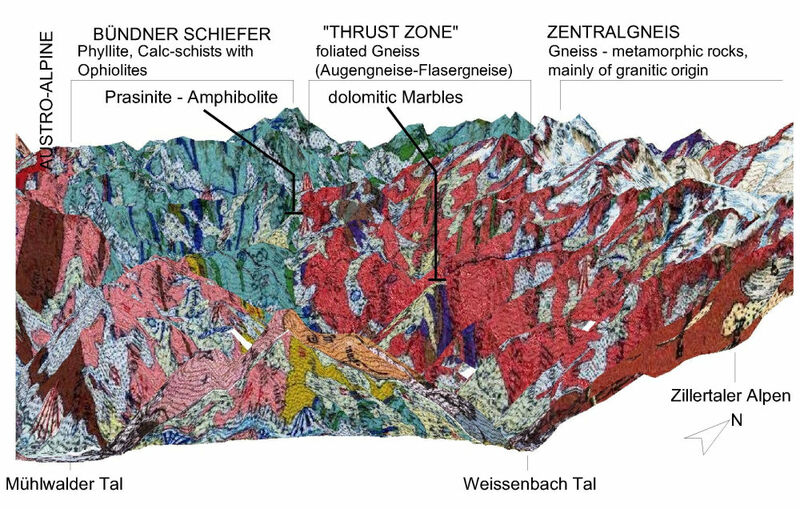 ROST, H. (1989): Zur Geologie, Petrographie und Tektonik des Pennins, der Matreier Zone und des Altkristallins zwischen Pürschbach und Grossklausenbach (Durreck-Gruppe, Ahrntal, Südtirol). Unveröffentlichte Diplomarbeit am institut für Geologie und Mineralogie Friedrich-Alexander-Universität Erlangen-Nürnberg: 192 S.